The Rotring 600 was first released in 1989. 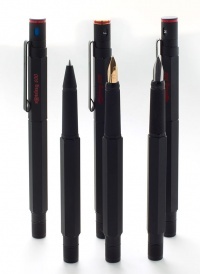 Rotring descibes the 600 as their "entry into the upscale writing instrument market", "designed with a hexagonal barrel to prevent it from rolling on the architects drawing table. It is machined out of one piece of brass on a lathe, providing it with ample weight to ensure that the architect need not apply extra pressure when creating". The Rotring 600 was originally made in Germany before production moved to Japan. The early Rotring 600 pencils used to have a coarser knurling grip with the same pattern as the lead indicator.. At that time Rotring also released a similar Koh-I-Noor branded pen which shared the coarser knurling. One explanation for the transition to the later, finer knurling might be a desire to appeal Japanese tastes . The current (2018) knurling on the grip is the same as the one found on the early 600 ballpoint . Rotring 600 fountain pen caps from different generations. Over the years there have been different generations of the fountain pen version. There is no printing on the cap or body. This generation features deep knurling, bevel above red ring 50% of height. This generation was only available in with a steel nib. Unlike later generations the nib indicator has no "L" setting.setting..
Rotring 600 is printed on the cap. A different colour was used for the print (RAL 3001). Features deep knurling. Bevel above red ring 50% of height, cap is slightly bigger then 1st and 2nd generation. Rollerball and Gold versions were available. 2nd or 3rd generation fountain pens without printing were initially sold via the Rotring branch that sold promotional items to be printed with the promoting company's logo. USA only, imported by Levenger, produced to Levenger's specifications in Japan. Not much information is available about this generation. The 4th Generation Second Wave has Levenger printed on the side. Additional silver holding lugs protrude from the grip. A similar pen is still available from Levenger as a ballpoint pen, rollerball and fountain pen, as part of their L-Tech series. . 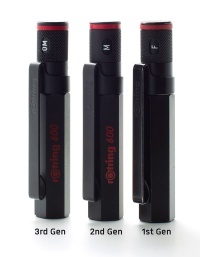 The Rotring 600 was also sold as a ballpoint pen, in either black or silver (matching trim) or with gold trim. In 2018 the ballpoint was re-released as the Rotring 600 (knock) and Rotring 800 (twist). This page was last modified on 22 February 2019, at 19:34.